Thomas Fan was the first man to open up a Brazilian jiu jitsu club in Hong Kong, and also the first Chinese to ref a UFC event - three so far. I spoke to him a few times, in Shanghai for an event, in Macao for the UFC event there, and most recently in Tokyo at UFC Japan. Here are some things Thomas had to say about BJJ in Hong Kong, ref’ing, and the current state of martial arts in Hong Kong. Fightland: How and when did you get into BJJ? Tomas Fan: I started training Brazilian jiu jitsu and grappling around 1997 in London. That was the first generation of BJJ/grappling in those days. I wanted to train BJJ/grappling like most people back then because of the UFC. I remember mail ordering a VHS of UFC2 after seeing it advertised in a Martial Arts magazine called COMBAT. Before that I had trained in a few different martial arts, karate, taekwondo, Thai boxing and kungfu. I also did a little competitive fighting and was always religiously reading a ton of books and magazines on different martial arts on Bruce Lee and Jeet Kun Do. I was fascinated by the idea of being a complete fighter! Before MMA, back then it was mostly Vale Tudo from Brazil, then UFC from the US and then PRIDEFC from Japan, which of course took MMA to mainstream with the best fighters in the world. Before all that I used to think Muay Thai was the ultimate combat sport. It was actually watching a program called 'Bushido' on UK cable TV that really got me hooked, this was Japanese Hybrid wrestling with open palm strikes & kicks called UWF which got me interested in grappling as a form of fighting… it seemed so real back then, until I came across UFC and BJJ with Royce Gracie as well as Vale Tudo... all stuff on VHS we would often purchased from some little video shop through word of mouth back in the day! 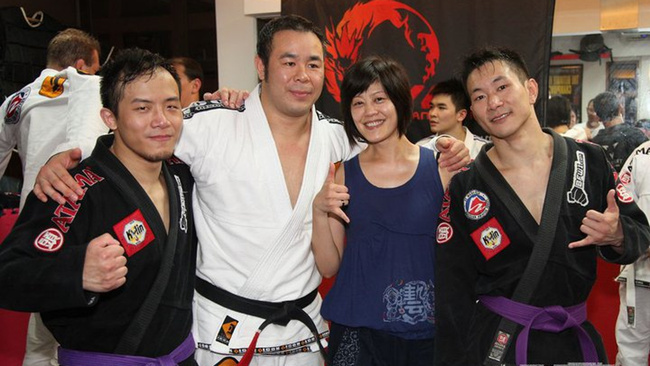 How did get your start teaching BJJ in Hong Kong? I moved to Hong Kong around 2002 as a blue belt in BJJ and got myself a pretty decent job as a osteopath. I was looking for schools to train where I could continue with BJJ but soon realised there was nothing around. At the beginning I would go round and introduce myself to Judo clubs and sometimes Thai boxing, kungfu schools, places I had seen on the internet or just walking around Hong Kong. I think the Judo guys were more accepting, as BJJ is similar to the Newaza they practised, but even when I used to school them on the groundwork, they were never really interested in learning more BJJ. The other schools thought I was a bit strange, just showing up and introducing submission skills to them...later which I never thought about til I told my students… people thought I was “Dojo storming,” which wasn't my intention of course, especially not on my own haha. It was when I saw a small ad in a magazine, saying Gracie jiu jitsu classes that I could train or coach BJJ, naturally I sought the guys out and when I showed up, there were a couple of blue belts who had trained in Australia with a handful of beginners. We tried to kill each other since its our 1st training session (laughs)… from there I ended up teaching alongside the guys and eventually leading the group. The numbers would always vary from a handful to over 20 guys. In the beginning I found out that guys in HK weren't used to being pushed really hard, not like the training style I was used to back in UK. I remember I had over 20 people one class, next class like around five showed up. I have since learnt how to cater for classes depending on the type of guys that will show up! From that humble beginning, BJJ over the last 12 years has developed into what it is today. 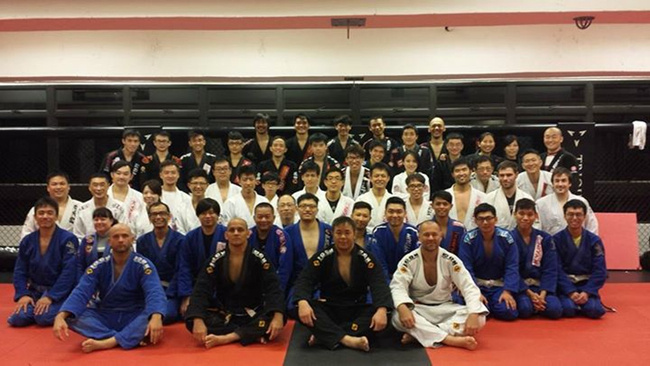 Now there are at least 6-7 clubs, some who have been students of mine, including my Team Kylin BJJ based out of the Triquest MMA Academy in HK with overseas black belts from Brazil, US and Japan which is amazing given how small HK is. There are good legit schools here now, but unfortunately also some McDojo schools with fake belts fooling the public. But I can proudly say that even with people coming and going, I have contributed to developing local Hong Kong Bjjers and currently I have two very good Brown belts who have been with me for 8 years. BJJ has definitely grown a lot in HK, as mentioned there are bunch of clubs which offer BJJ training with high quality overseas Black Belts and with MMA gaining ground in Asia especially with UFC doing more shows in recent years, the awareness of the sport has increased with local films like 'Unbeatable' using MMA as a storyline. There are now regular BJJ tournaments in Asia, at least twice a year in HK which I heard this year attracted up to 300+ competitors. My student has also ventured into Shenzhen China, and we will be organizing a 2nd BJJ tournament later in the year. How did you get into ref'ing and judging? What started that process? 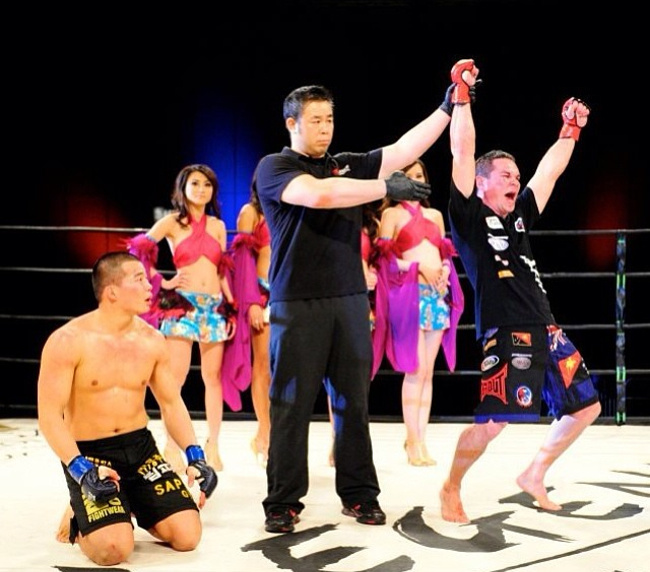 My first experience as a MMA referee was in Beijing at Art of War 12. My friend Andy Pi happened to be the promoter for the show and called me to ask if I would be interested to be part of the show. I said sure, I've never done it before but I have watched a ton of UFC and PRIDE, understand submissions because of my BJJ training and also my previous stand up martial arts. But I have never fought in MMA, only sparring and coaching guys for MMA, but I have a fair grasp of the mechanics in a MMA match. Little did I know from that show it would lead me to eventually becoming the first Chinese referee to work in the UFC Octagon! I have to say also that Art of War 12 was truly an amazing one of a kind experience - this was like the who's who of MMA at the time. First I find out I was to ref alongside Big John McCarthy and Yuji Shimada! Then I find out that a lot of huge names were in attendance: Rickson, Royce, Royler, Renzo, Igor and Rolles Gracie who was fighting, Ricardo Liborio, Fabricio Werdum, Tim Silvia, Bas Rutten, Steven Quadro, Damien Maia… there was a few more famous guys I used to watch on TV but can't remember, but that weekend was simply WOW! imagine just hanging out with all these guys meeting them at breakfast, lunch and dinner for 2-3 days. Apart from Art of War series, which I refereed a couple more times, the other major show was Legend FC which was based in HK. I refereed for a total of nine Legend FC shows. I'm very grateful to Mr. Mike Haskamp from Legend FC. From there I would eventually be called up to the biggest MMA show—the UFC. It’s amazing, there I was watching all this stuff on bad quality VHS all those years ago and now I've been inside that Octagon refereeing some of the best fighters in the world, just amazing! Tell me a bit about UFC Macao, how was that experience, and how does it compare with other events you worked at? This is the 2nd UFC Macao show I've worked on vs. Silva card, which was amazing. That show I worked alongside Marc Goddard and Herb Dean. The UFC show in Macao I was assigned two fights as there was four referees including very experienced MMA referees Steve Perceval & John Sharp from Australia, and Leon Edwards from UK. All these guys were real gents and working and watching them work has improved my awareness and skills as a referee and also judge. I feel very fortunate to have spent time with these guys and hope to get more call-ups in the future. The actual process of interaction with fighters and being in the cage is no different from other smaller shows, but the experience is of course on a much grander scale, with amazing production and atmosphere. As the best MMA show in the world with the best fighters, the excitement factor at a UFC event is way higher. Also speaking just as an official for UFC, I would say you are well looked after in terms of comfort, transport etc. which can be hit or missed with some events I've worked at. How would you characterize and describe the martial arts scene in HK? Most people from the West when you mention martial arts and HK automatically think of Bruce Lee and all the kungfu experts, the rooftop fights they read about, but like the rest of the world unless there is still a strong martial culture or it’s part of the school curriculum, traditional martial arts I feel sadly has been steadily declining. People, culture, technology, work have changed each generation nowadays, young people now don't have the patience for practicing long hours, year in, year out to perfect a series of forms or kata or to defend an art. They would prefer to get a quick fix, a buzz with a good sweat, that’s why Thai boxing or really Thai boxing circuit training is so popular these days even amongst the young girls. Its different now, most people when they pay school fees, they feel you are their coach and they should receive their money's worth. I think the scene in HK, there still some genuine good solid instructors, sifus around… but most people from different martial arts generally keep amongst themselves without any exchange really. There is a pretty good Thai boxing/Sanda scene here which has occasional competitions which is ok, but it probably could do with comparing themselves outside of HK, as honestly speaking, it’s not a level which could do well anywhere else. MMA in Hong Kong is still in its infancy right now, a lot of expats are into it with a handful who are really good… but as far as locals go, there’s still a lot of room for improvement. That’s simply because a lot are afraid to go outside their comfort zone not because of a lack of potential talent.